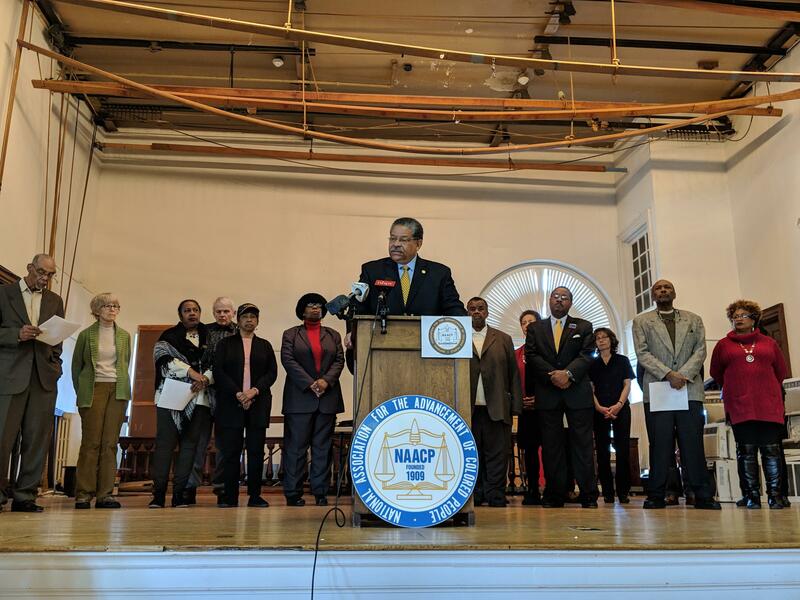 Juan Cofield, head of the New England Area Conference of the NAACP, holds a press conference at Dover City Hall with other NAACP leaders from across the region. Dover school officials say they won't heed renewed calls from regional NAACP leaders for a teacher at the center of a racist controversy to be fired. Dover High School history teacher John Carver gave an assignment on the Reconstruction Era last fall that led students to sing a racist parody of Jingle Bells, including references to the KKK and murdering African-Americans. Listen to Reporter Annie Ropeik discuss the Dover schools' controversy with All Things Considered Host Peter Biello. The song was caught on video, and Carver was put on paid administrative leave. School officials decided last month to let Carver resume teaching and coaching this fall after he undergoes racial bias training and completes a series of check-ins. NAACP leaders from across New England decried that decision at a press conference at Dover City Hall Tuesday morning. Juan Cofield is the head of the New England Area Conference of NAACP chapters, and he says not firing Carver will teach students the wrong lessons. In an interview Tuesday afternoon with NHPR, school superintendent William Harbron defended the decision. He says it’s an effort to change school culture and heal long-term, rather than focus on short-term punishment. “If we would create a system of fear because you make a mistake, then how do we cause adults to grow within the system and to become better educators and to really embrace the topic of racism and prejudice?” Harbron says. But John Reed, a former high school social studies teacher who heads up the Cape Cod NAACP, says retaining Carver plays into a political climate that emboldens prejudice, and will perpetuate that culture at New Hampshire schools. At least two people in the small audience at Tuesday’s press conference defended Carver, saying the NAACP wants him fired without all the facts in order, to placate people who have been offended. He says they’re not trying to determine if Carver is or is not a racist. Instead, he says they feel Carver’s actions show poor judgment, and a callousness that makes him unfit to teach. And Johnson says the district’s response is only the latest instance of the state’s educational system glossing over intolerance. "It's all over the state. People just haven't recognized it, because we haven't talked about it,” he says. “You need to focus in on this, because this is everywhere now, and if we don't nip this in the bud, there's going to be hell to pay three, four years down the road." Dover Schools Superintendent William Harbron (in suit jacket, standing at left) addresses participants at a Dover High School diversity forum last month. Johnson says he expects there will be funding for more teacher diversity training in the state’s new budget. Lawmakers begin negotiating on that plan next week. Harbron, the Dover superintendent, says his district’s teachers were already a few months into their own new diversity training when the “jingle incident” occurred late last year. Last week, as part of ongoing response, he says they signed a contract to receive federal equity training assistance with a “long-range” diversity education plan for students, faculty and staff. Harbron says they’re also working with local nonprofits and state diversity leaders on further community outreach this year. Until now, the NAACP was part of their steering committee on those efforts – but Rogers Johnson says they won’t continue participating in the district’s work if Carver keeps his job. "We're not going to validate your decision, we're going to fight you on this decision," he says. "And just for your knowledge, we're not going away. We're going to keep fighting." Johnson and his colleagues also want more information about Carver, and how the district investigated after the video surfaced. But Johnson, of the Seacoast NAACP, says he’s concerned about that process. "An individual who has not made a single utterance of remorse, contrition or even to say he’s sorry can go through any course to be rehabilitated and come out on the back end knowing what to say, when to say it and who to say it to, and not have an inkling of understanding of why he's doing it, other than to stay out of trouble." Carver has not made any public statements since the video was posted late last year. He’s taught and coached baseball at Dover High for at least 20 years, according to Harbron, after graduating from the school himself in the 1980s. Carver will have been on paid leave for nearly eight months if and when he returns to teaching this fall. 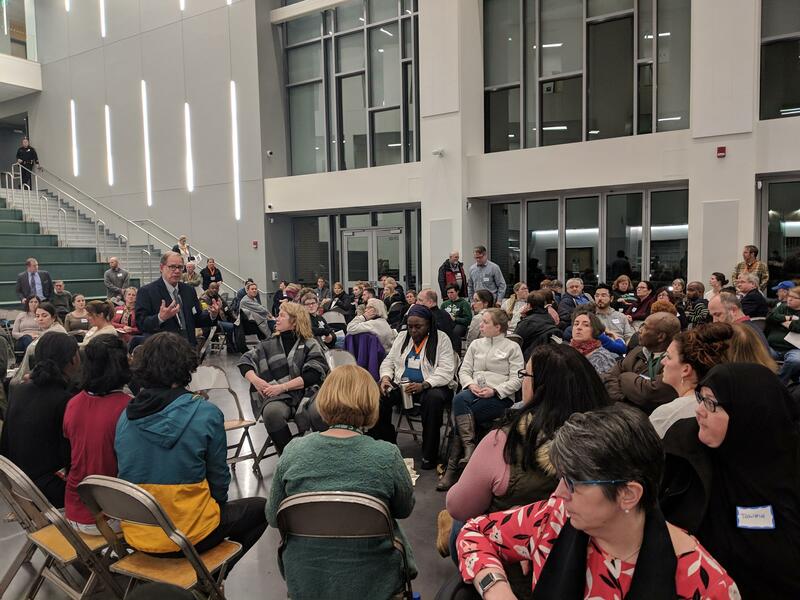 Around 200 Seacoast-area residents met Wednesday night to talk about their community’s relationship to race and stereotypes. The forum was part of the district’s response to a video that surfaced last month of Dover High School students singing racist lyrics to the tune of Jingle Bells as part of a class assignment. A report from the Juvenile Reform Project, a coalition of New Hampshire advocacy organizations, says that school discipline in New Hampshire is disproportionately harsh on students of color and students with disabilities. On a warm, muggy Friday morning in the middle school’s library, 22 chairs are set around tables, in a u-shape. Barbara Slayton is making sure the projector’s running. She’s the coordinator of school wellness at the Franklin School District, and she requested this training, after attending one herself a few months ago. It's been a year since an incident in Claremont involving the near-hanging of a young, biracial boy made national news. This week, NHPR is looking at how that event impacted local residents, including the then-superintedent of schools, Middleton McGoodwin. As he tells it, the incident forced him to reflect uncomfortably on his own history with race.